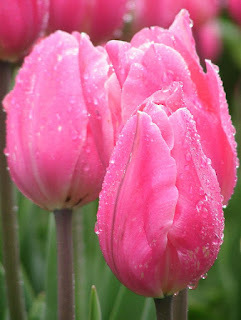 The Feminine Gift: Tulips and trees : where is your happiness? Tulips and trees : where is your happiness? I went for a drive with my mom yesterday. It's one of our favourite things to do. We call it a Horn Trip because it goes around the almost-island of where she lives. It was an idyllic day: the sky was blue, the sun was warm through the windows of the car, and we could see many signs of returning life in the busy birds and greening pastures. I didn't need anything else in that moment... except for maybe a wee bit of chocolate. It was practically perfect in every way. There you are; a round baker's dozen of my favourite things. I can't believe I didn't include chocolate! There are certainly other things that make me happy; these ones came to mind as I was jotting last night. How about you? Where is your bliss? What are your favourite things? What makes you happy? Tulips, the sound of a fan while falling asleep, the sound of rain while falling asleep, hot baths with good books, the SMELL of my babies (they should bottle that scent - it's instantly calming and soothing), friends I can laugh until I cry with, gold medal ribbon ice cream, the ocean, campfires, sleeping through the night, thunderstorms and still winter nights after a snowfall where the world just seems to be holding her breath. So true! Is there anyone that doesn't like tulips? They are just so 'spring-y' and a sign that there is still life in the world. The sound of rain on the roof of a tent trailer. Tea almost too hot to drink. And I'm with Carly on the Ocean, sitting around the campfire quiet and the smell and sounds of thunderstorms. Miss Carly, I'm sensing that sleep makes you happy? I'm tempted to say "just put your mind to it" but I do understand and sympathize. My most practical suggestion is to sleep in the Baby Man's room. I think it's magic.